Fast paced life in the city has many positives, however, tightly packed flats with little or no gardens can make owning pets something of an impossibility. National Pet Month can be a heart-breaking reminder of that dog/cat shaped hole in your two-bed flat, so fill that gaping void in your heart with a visit to an animal café. The concept of animal cafés originated in South East Asia and has been a growing trend in the UK over the past few years. Whilst most cities offer one or two Cat Cafés, Dog Cafés are few and far between. So, check out this guide of where to go to kick back with some dogs this National Pet Month. For many, the presence of a dog is a refreshing and calming break from modern life. So, the dense population of both students and professionals in the city of Newcastle will no doubt benefit from a trip to Dog and Scone, where you can relax with their eight resident pups. Entry to the café costs a meagre £5.20 (which includes your first drink) and ensures the dogs are receiving regular, superb care. They offer drinks and a small selection of food at very reasonable prices but keep an eye out for those greedy dogs sniffing around your meal! The Dog and Scone website features a line-up of the dogs on offer, honestly, we would die for Noodle (pictured above), but have a look at what we had to say when we met the dogs last year. 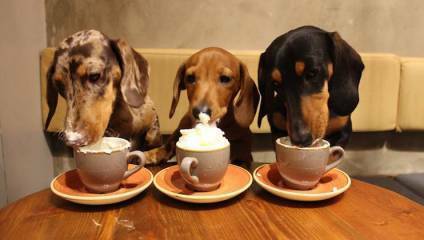 The Long Dog Café originated after the boss, short-haired dachshund Big Gav, refused to sit in Aberdeen’s wet and windy conditions when his owners wanted to stop off in for a drink and a bite to eat. Joined by matching sausage dog Linda, the pair are the ultimate top dogs of the café and have the rest of the staff wrapped around their little paws. Sadly, Linda and Gav don’t spend all their time at the café (they’re far too busy day-to-day), but customers are encouraged to bring their dogs down to Long Dog, meaning the place is more often than not teeming with Terriers. Their menu is small but looks incredibly impressive on their Instagram, and they have amazing looking ‘freakshakes’ and desserts on offer! They also have a doggie boutique a few doors down, for if your dog fancies a spot of shopping after their lunch out. Up in the North East we have two Doggie Diners with a difference. Whilst this is another non-residential dog café (you can bring your dog in, however, there are no live-in dogs) it is still a haven for dog lovers, as it offers a dog-only menu. Dogs can order 'pupcakes', ice cream cookies, Doggie afternoon tea, and even Woof Dog Beer. This extensive menu will no doubt attract dogs from all across the North, which incidentally makes it a great lunch spot for those of you missing having dogs in your life. If you’re extremely lucky you might stumble upon one of their doggie birthday parties; a group of dogs all wearing party hats = the cutest thing imaginable. Let's just hope they don't overdo it on the Pawsecco. Chihuahuas are the marmite of the doggie world, you either love them or you hate them. For those of you who love them, Edinburgh’s first ever dog café is going to be a true treat. Combining two of life’s great pleasures (cake and dogs), the Chihuahua Café is the perfect spot to grab a bite to eat in the company of eight chihuahuas. The Chihuahua is a famously glamorous companion dog, that loves nothing more than a cuddle and a snooze, which makes them the perfect resident café dogs. The dogs are ready to be pet, played with and loved - and a well-timed snap will make the perfect addition to your Instagram feed. One 50-minute booking only costs £10, which of course goes towards the glamourous lifestyle that chihuahuas naturally deserve. For a super cute boost of inspiration, check out each dog’s individual Instagram story. As a UK wide pop-up experience, Pug Café operates as a dedicated pug experience, bringing together pug owners and pug lovers in a safe and enjoyable space- and always making pug happiness the centre of their attention. Your pooch will make new pooch friends, all whilst enjoying a ‘puguccino’ or a ‘wuffin’. Rather than tying itself down to one location, Pug Café organises various events in different cities across the country. They also have sister companies with Dachshund Café and Frenchie Café, but pugs are without a doubt their first loves. Whilst they have no events currently booked in, they have promised big things for 2019 and intend to branch out into new cities, so joint their Facebook group in order to hear about events as soon as they’re announced.